Kelly Clarkson and Carrie Underwood are the undisputed queens of American Idol, but would they retain their mythic stature if we didn’t know that they had gone on to chart and Grammy success, and were judged solely on the performances they gave when they were on the show? Would they still be considered the very cream of the crop? Since we are about to crown the (fading) reality titan’s 12th winner, I thought it might be interesting to take a look back at the 11 men and women who have won the title, and rank them not on their post-Idol success or what we know about them in retrospect, but rather on how they did when they were a contestant on the show. Just the performances themselves. Before actually making the list I felt sure the obvious suspects would take the top spots, but upon revisiting seasons past and uncovering and remembering some old gems, I found myself surprised by some of the outcomes. I should state at the outset that though I tried to approach this in an unbiased manner, this is an obviously, and unavoidably, subjective list. In the spirit of full disclosure, it’s only fair to acknowledge that I am, to put it mildly, a huge fan of what both Kelly and Carrie have done in their post-show careers, and have Phillip Phillips’ current album on repeat on Spotify. But I really tried, as best I could, to put all of that aside and focus just on the Idol performances themselves. If you disagree with some of my assessments, I hope you’ll sound off in the comments section below. Each of the winners has something to recommend their voice, but only a handful have something truly special based on vocal ability alone that was clearly apparent during their Idol run. I made my determinations based on how spectacular the individual’s voice is, and how consistently that was demonstrated throughout their run on the show. 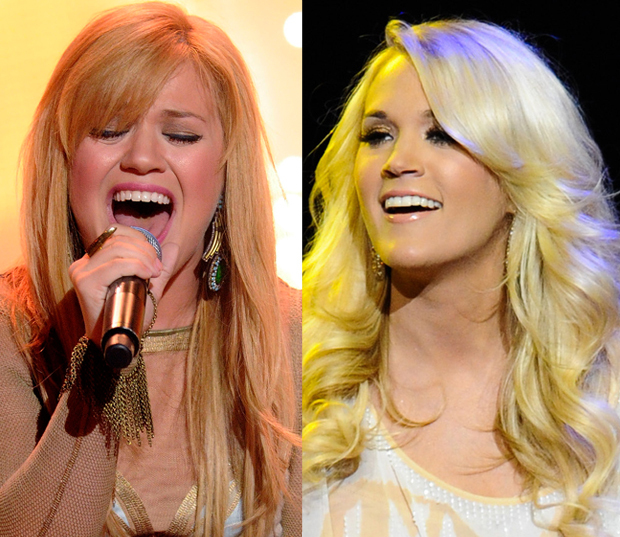 Based on performances like “Natural Woman” and “Without You,” Kelly Clarkson took the top spot here, followed by Carrie Underwood, Fantasia, Jordin Sparks and Ruben Studdard. The rest of the list are the singers who relied more on their interpretative or performance skills than on vocal fireworks — in order, David Cook, Taylor Hicks, Kris Allen, Philip Phillips, Scotty McCreery and Lee Dewyze. This category is about the jaw-droppers — what the judges often refer to as the “Idol moments.” Almost all of the winners have had a least one — after all, they had to have been compelling enough to win the show — so the rankings in this category are based on how many they produced, and how memorable their signature “moment” was. Here, Fantasia’s “Summertime” catapulted her to the top spot, followed by Kelly and her “Natural Woman,” Carrie and her “Alone,” David Cook and his “Billie Jean,” and Jordin Sparks and her “I Who Have Nothing.” Kris, Ruben, Taylor, Phil, Scotty and Lee, in order, make up the Bottom 6. This category is about individuality and inventiveness, and how much the contestant really made the songs their own. Winners in later seasons have a big of an advantage here, as this is an attribute that has gained more and more value as the run of the show has gone on — early seasons rewarded vocal firepower over subtle interpretation. Having said that, David Cook, the first contestant to really experiment with alternative arrangements to songs, grabs the top spot for his work on songs like “Always Be My Baby,” “Billie Jean,” and “Little Sparrow,” followed by Kris Allen, who used his ingenuity on numbers like “She Works Hard for the Money” and “Heartless” to ride the wave to victory. Fantasia, Kelly and Carrie didn’t necessarily change up arrangements, but they did know how to interpret songs like “Summertime,” “Stuff Like That There,” and “God Bless the Broken Road,” respectively, so they round out the Top 5. The next tier found Phil Phillips (who lost a few points for his Dave Matthews derivativeness), followed by Jordin, Ruben, Taylor, Scotty and Lee. The stage presence category is where Queen Bees Kelly and Carrie stumbled, as both spent most of their performance time planted on the middle of the stage singing their faces off. Fantasia, however, definitely knew how to put on a show, and she grabs the top spot, followed by Taylor Hicks who, grating as it may have been, certainly had a performance style all his own. David Cook had the rocker thing down so he grabs the number three spot here, followed by sassy Jordin Sparks and Kris Allen, who worked his bashful musician thing at the piano and on guitar. Kelly, Scotty, Carrie, Ruben, Philip and Lee round out the list. After the points were assigned in each category, the somewhat surprising winner of these rankings is…Fantasia! Topping both the Showstoppers and Stage Presence categories, and coming in third on Vocals and Artistry, her body of work while on American Idol is, to me, the most well rounded. Kelly Clarkson came in second, followed by David Cook, whose high marks in the Artistry category allowed him to finish ahead of number four Carrie Underwood and number five Jordin Sparks, both of whom are clearly better singers than he. Kris Allen, often thought of as one of the weaker winners of the show, actually finished number six in these standings, followed by the all-but-forgotten Taylor Hicks and Ruben Studdard at numbers seven and eight. The three most recent winners round out the Bottom 3 — in order, Phil Phillips, Scotty McCreery and poor Lee Dewyze, who finished last in every single category. And there you have it! I’m sure you disagree on at least some of these determinations, so sound off in the Comments section below! READ: Are Reality Television Results Shows About to Become Obsolete? This entry was posted in Television and tagged American Idol, Carrie Underwood, David Cook, Fantasia, Jordin Sparks, Kelly Clarkson, Kris Allen, Lee Dewyze, phillip phillips, Ruben Studdard, Scotty McCreery, Taylor Hicks. Bookmark the permalink. I agree with your rankings except for Fantasia. I stopped watching while she was on. I liked Ruben a lot but wondered if he had the ambition and energy to reach star level after the show ended. I would put some of the lower finishers higher than the last few winners. ( e.g.Jennifer Hudson, Daughtry). The early contestants were ground breakers. The later ones had the advantage of watching what succeeded earlier, better support from mentors and producers and no Simon to irritate or impress voters. Impressive statistics – I like the logic and can’t disagree with the outcomes. You are correct in that the mid-to-later years stressed re-mastering familiar tunes and David Cook was the undisputed king of that skill set. Nice article! I think it’s GREAT you included Stage Presence. People often wonder why they can’t get into contestants that have great voices but the performances lacking something. I always said that’s what got Taylor Hicks the win his season. He was entertaining and had great stage presence that got him votes. I agree with the overall ranking trying to grasp Ruben being behind Taylor Hicks but I understand based on the categories. Fantasia knows how to really connect with what she is singing which led people to connect with her as an artist. As I read this, all I can think is that it’s lucky Adam Lambert wasn’t in the mix here or he would have walked away with it in nearly every category, if not all.